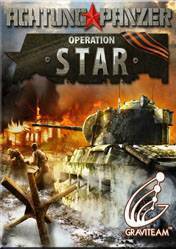 Graviteam Tactics : Operation Star is the sequel of the strategy game Achtung Panzer: Kharkov 1943. This is the typical game set in World War II with solid graphics and sprawling battlefields, where the use of tanks World War II is emphasized. Take the role of a commander in the defense of Kharkov and we will have all the materials and resources that were available at the time: tanks, guns, and brave soldiers and our decisions determine who wins the Battle of Kharkov. Graviteam Tactics has a high replay value and a very flexible AI. Choose the best strategy and defend your base from endless possibilities. Soldiers have real behavior and each soldier has several basic parameters, such as experience level, fatigue, and morale , which affect their behavior and their effectiveness in combat. There is a detailed recreation of weapons and realistic ballistics. A game with many options and that will be indispensable for lovers set in the second great war strategy games. There are no comments yet about Graviteam Tactics: Operation Star . You can be the first one!